Yeah!! The I-Spies are coming. Red, do what's best for you and your well-being. If I have to wait an extra day, no problem. I love this time in the swap . . . an-ti-ci-pation!!! Take it easy Red, this is supposed to be fun...for everyone. im excited to see the charms people picked out! Okay, I guess I misunderstood someone's questions for signing up, so that means I "believe" between that answer, and a few dropping out, I think I have everyone's charms. I will begin to redistribute tonight. I will try to get them out in the mail tomorrow, but with it being month-end at work, when I get home tonight is anyone's guess, and I may need tomorrow to get them all situated. Thanks, Red, for all you do! Excited that fun charms will be here soon! I remember seeing a pattern similar to the lollipop one that was a magnifying glass. It would be more applique, but cool idea. That is a magnifying glass Pinkflowers, or it is supposed to be. Oh, okay. The pattern I saw before had a dark fabric around the outer edge of the magnifying glass. That's why Red said it looked like a lollipop and she would make the handle thicker. Thank you Red... please don't stress out over getting the packages mailed. We'll enjoy them whenever they show up. You have done a great job keeping up with everyone. Not your fault if people drop out and don't tell you! Thanks for the words of comfort, friends! We ended up with some Really fun prints this time around. I can see why people get hooked on these things! I had no idea some of these were even in print. Ritz crackers? Cracked me up!! You think that's funny (Ritz crackers), I also have nachos, egg McMuffins and hotdog sticks. when I bought them, I thought it was pizza, burgers and hot dogs. "hotdog sticks" = corndogs for me! I gave up baking and started quilting so I'd quit eating my mistakes (and getting fat). 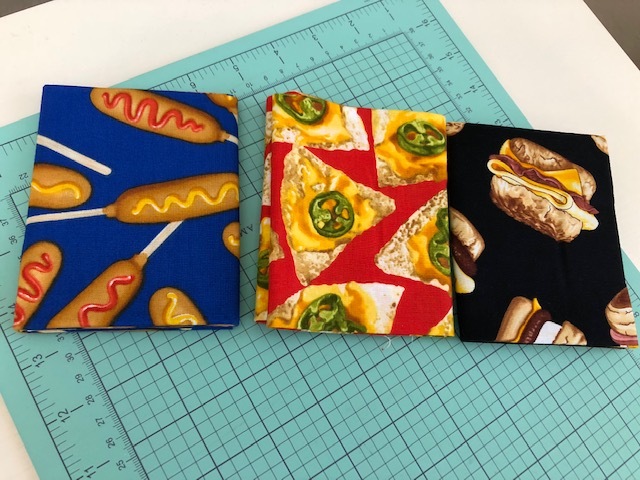 Don't need fabric that makes me hungry! Those are awesome! Some kiddo's going to love those in their blankies! My charms arrived today! There are some great ones, too. I've not seen most of them before. Score!!!! Thanks Red for hosting this. My charms arrived today! And I haven't even been able to look at them yet, ugh! Heading to bed...I'll have fun with them tomorrow! I-Spy charms are fantastic! So many different and unusual designs that I look forward to making a couple of I-Spy quilts. Thanks to those who sent the extras and special little treats - your thoughtfulness is much appreciated. Red, thank you for coordinating and keeping us all happy! I am hoping mine show up today - really looking forward to getting them. I went through my stash and pulled up everything I thought would work for I spy and was happy I could get enough from my stash. I've always wanted to make an I spy quilt and I'll finally have enough variety of blocks to make some! I have my charms! They are all lovely and I thank everyone for their great swaps. Thanks Red for being such a great hostess. Also thanks for the little treats. Yea! mine showed up today!!!! Thank you everyone, and Red for hosting. Just found this magnifying glass pattern. It's appliqued, so I probably wouldn't make it, but it's darling. It's also free. Got my I Spy charms today and I got some really cute ones! Love new fabrics I've never seen. Thank you to everyone! And thanks for the extra charms, and the little goodies included too. So sweet! Thank you Red for hosting this! I had a great time with this swap, thank you to everyone who participated and all the extra goodies people sent. You are some of the most generous people I have met online. Huggsss!!! What about a future swap? Is there enough interest in another 5" swap (may be something other than I-spy), for November? My only concern is the mailing deadline would be closer to Christmas, which is busy for some folks. Or should we do one with a return After Christmas? Thoughts? Ideas? I have myself absorbed in Christmas fabrics. I don’t suppose anyone would want to swap those? I got mine and thank you all - and all the extras. Will be taking them to quilting group tomorrow to spread them out and look at each and every one. I would not be swapping until after the holidays. Maybe spring pastels? Red, thank you for organizing this swap and keeping everyone happy. I received my I Spy charms and was very surprised by the different interpretations people used. I realized my mindset was for a very young child and I was pleasantly reminded that both young and old can enjoy an I Spy. I confess I agonized over my choices and ended up purchasing the food only because I (wrongfully, mind you) thought people would not want what I had. So much for my first swap. Onto the next. Are we supposed to be doing feedback for this and if so, how? The more I play with my I-Spy charms the more I am so excited to get them stitched into a quilt or two. I appreciate each and every one of you who spent time in selecting and cutting these charms. I sure could use some time in sewing them (and all the other charms I've collected) but at the same time I would feel lost without this swap. I like Pamela's idea about swapping Christmas, just not sure how many people would be swapping. Anything you decide is fine with me. Red, you've been so good at organizing us! Thanks for all you do.